Ze'carga still has broken leg but he isn't usefless. With the help of Nova he inventories the captured plate armor, examining the design and what extra little bits it has. Like a crude climate control. And a water foci embedded into the chest plate. Noh, still with his new dagger, wants to claim the minian scout armors for the ferals, to make armor for the FSF out of them. Pelinore got a burn wound on his right shoulder from a mimian with fire sorcery (he's also missing the hair on that side of the head, burned off, though the art doesn't show that fully) and it's painful enough that he agrees to Dycle's suggestion of trying some minor empathy to soothe/heal the wound. Dan'iira, having had time to dress properly now instead of throwing on robe in the middle of the night, pays them a visit. The Nal'sarkoth got a fairly hefty chunk of loot out of the battle and are feeling generous enough that they refill the medical supplies for free. With a friendly warning to not get greedy. Elhvir finally tracks down Minlia to get her opinion on the golem design. Which she gives, despite being woken up. While she did go around negotiating for golem parts the true reason she slept so late was that she had too much of Odd'anna's ceak. Timotheus and Ash'arion are working on setting up additionl bbllist mounts. They aren't quite done yet but by the time the ship lifts off again there will be four ballistas on the ship, two on each side. The huge, captured ballista hs been dismantled and put into storage in the ship. The squirrel suits are finally done, one for a feral, one for a drow. The stiffness of the suit makes Mirrwyn waddle a bit when walking but she still seems to enjoy it. Caith'synn goes off to feed Fila'sofi. For starters anyway. Wei'rune is also bringing food, to the wounded Gultyrr. She will make sure he eats it all and after speaking with Ombr'eh will literally sit on him to prevent him from straining his hip joint too much too quickly. So when can we expect the wounded to make a full recovery? Last turn suggest that we need to return home for the wounded to fully heal. In our last adventure, Elhvir got a broken foot I think from a tunnel collapse, then he got right back up after a few turns. I'm okay sitting on the sidelines for a while, failing in my first mission as a squad leader kinda made me doubt my leadership skills. Also, I have a question Suntiger. When we inspected the Kashyra armor, it had foci gems, one of them being a water foci suggesting it was for combat. Which got me thinking that the Kashyra warriors are able to use mana arts with decent skills while wearing heavy armor. It reminds me of the Sargh and Sharen troops who are skilled in both armed combat and mana arts, even the Nal guards back in our colony days were able to use mana arts while in heavy gear. So I was thought, if they can do it, why not us? Is it possible for us to merge the warrior and mana specialist job into one profession? I'm not expecting our warriors to instantly know how to cast mana bolts and split the earth with the same amount of skill and power as the MS or the MS knowing how to be competent with a sword right off the bat. A lot of training for both professions would be required, but if it is possible, this can seriously improve the quality of our combatants. goblin6 wrote: So when can we expect the wounded to make a full recovery? Last turn suggest that we need to return home for the wounded to fully heal. In our last adventure, Elhvir got a broken foot I think from a tunnel collapse, then he got right back up after a few turns. I'm okay sitting on the sidelines for a while, failing in my first mission as a squad leader kinda made me doubt my leadership skills. Hard to give exact dates on recovery. Counting from longest to shortest the time of healing should roughly follow this pattern: Major bones broken, minor bones broken, internal bleeding/serious stab wounds in vital areas, concussions, serious cuts in non-vital areas, superficial cuts/sprains, bruises. As for Elhvir, I think Kern and I just missed that he was supposed to have a broken foot. The failiure of your squad wasn't due to your leadership, it was due to the sindri mimians being pretty good at what they do. Or to put it another way, thanks to your leadership none of your squad died when you lost the element of surprise for your attack. The ability to use mana arts and physical combat at the same time varies wildly among commoners and lesser clans. For the major clans, at least among the ones trained as warriors it's more par for the course. For example, pretty much every sharen warrior is a "magic knight". So are the Illhar'dro soldiers, and the Kashyra warriors and at least most of the officers among the Sarghress (the ability of the grunts/recruits varies wildly). However, for the tei'kliath it's not so much an issue of skill, or lack thereof. It's the location that has the largest impact. On the surface the largest factor against heavy use of mana-based attacks and physical fighting at the same time is the general lack of mana. The tei'kaliath warriors would be quite capable of using both mana and steel to fight in Ama'varde for example. 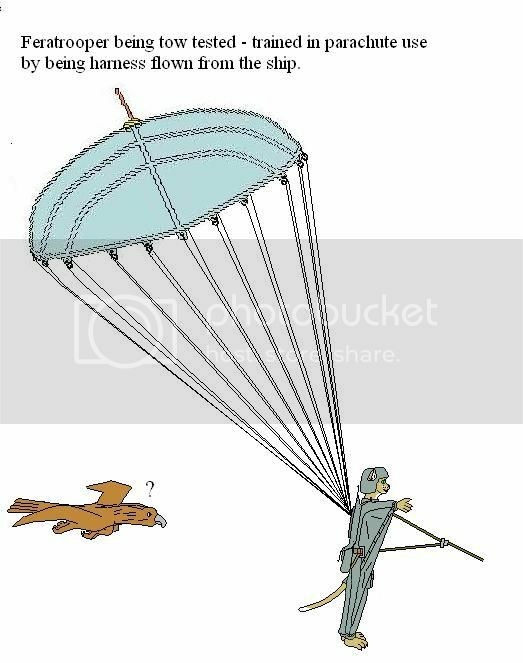 They would also be able to do so, albeit to a slightly lesser degree, in close proximity to the airship. Or places like the nal'sarkoth outpost. However, both fighting (especially in armor) and heavy use of mana takes its toll on the body. Ergo, when you're out exploring it is a high chance of the low level of ambient mana making such fighting extremely dangerous. Fighting in plate with highly limited mana attacks and defenses is viable, like a close range mana blast or a quick, temporary personal mana shield. It is also viable for those that are trained mana specialists (meaning they have a larger than average aura and/or have recieved advanved training in how to use their affinity/high arts) to fight with a heavy emphasis on using mana - as long as the fight doesn't drag out too long. It is still possible to go all out and use both mana-based and physical attacks but in a mana-poor environment such an act would mean you literally drained yourself to the point of mana deprivation and possibly death. Good for lasts stands or other such extreme cases perhaps. Auras do grow as a fae age so an older drow would have a larger aura to draw from, being more capable of using both mana and physical attacks at the same time even in a mana poor environment. However, since the aura also takes more mana to maintain their bodies in good physical condition they would also reach the point of man deprivtion faster. suntiger745 wrote: The huge, captured ballista hs been dismantled and put into storage in the ship. could you give us the size of our storage and stored equipment in cubic metres and maybe the dimensions of the biggest storeroom? or do you deem that too bothersome and/or too restricting for future storytelling? Afraid not. Partly because it's too restrictive, partly because we haven't calculated the ship dimensions so closely. Me and Kern are more focused on putting together an engaging story for the clan/players to partake in. Going into such specific detail about the ship, while possible, would require more reasearch (=time) than either of us have available though. For some guidelines: The ship is supposed to be large enough to take the entire colony if it really has to (around 300 people). If that's the case you have little to no strage space left though. At the moment you have plenty of storage space left. The storage holds aren't that large individually though (too much open space weakens the hull integrity). I think I mentioned somewhere that the cafeteria is supposed to be the largest room in the entire ship. If not, consider this me mentioning it. It has been shown in the comic, though I don't think the size has been very consistent (because we haven't provided Reza with more specific details than 'cafeteria' and 'large room'). It's supposed to seat arounf 30 people at a time. I think I mentioned before that you had to eat in shifts. Can't take everyone onboard at once. The dismantled ballista is currently taking up two storage rooms. suntiger745 wrote: For some guidelines: The ship is supposed to be large enough to take the entire colony if it really has to (around 300 people). If that's the case you have little to no strage space left though. going by that and assuming an average volume of 0.08m^3 per crew member*, the ship should have roughly 24m^3 of storage (or room that can be turned into storage if need be), about 8m^3 of which are currently occupied. Might be an artist misunderstanding due to poor scripting on our part since we never specified the size to Reza beyond 'large ballista' and 'huge ballista'. I do know that it was shown in the incorrect size at the last leader and event page, where it takes up a large part of the deck. It was supposed to take up most of the foredeck, not the main deck. You can take it as official GM ruling that the cafeteria is the largest room on the ship if you like though, regardless of what has been shown so far. That's how it's stupposed to be. Thank you for the update. And the general size information. 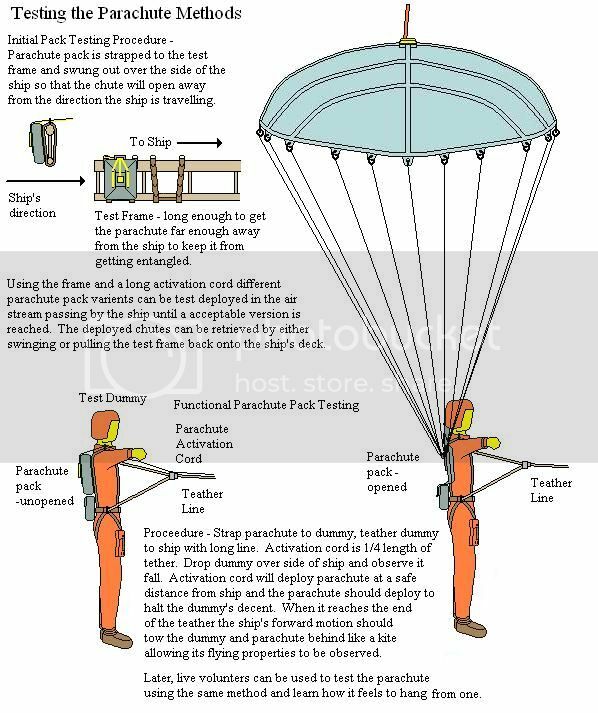 As far as I'm concerned no one is going to free fall test the personal glider suit until the parachute pack has been tested out as a back up for it. So my plan is to continue with design refinement, testing, and training until we have the parachute ready as well. Illustrations reposted here so you don't have to go looking for them.